Shah Rukh Khan's daughter Suhana Khan and wife Gauri Khan recently attended a family wedding in Delhi and photos from inside the festivities have made their way to social media and are being shared by fan-clubs. The Internet is currently obsessing over how pretty Suhana looks in the various traditional attires she sported at the big fat shaadi. In the viral photos, Suhana can be seen wearing lehengas for what appears to be three different functions. 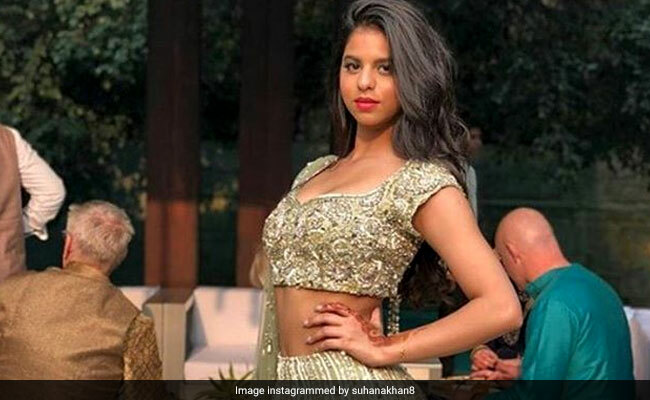 Be it maroon, pink or gold, Suhana rocked all the looks like a boss but the Internet's favourite appears to be Suhana's beige and gold lehenga. Suhana, one of the most talked-about star kids of Bollywood, paired an embroidered choli with a floor-weeping, patterned lehenga and she opted to complete the look with zero-accessories. We also spotted Gauri Khan rocking a blue and beige sari and joining her in the festivities were her sister-in-law Namita Chhiba. Suhana also shares the frame with her cousin Alia Chhiba. This is the only photo Gauri Khan shared from the Delhi wedding. Suhana, 17, who studies in Mumbai's Dhirubhai Ambani International School, is home for the holidays and so is Aryan, 19. He is currently studying films in the University of California while Shah Rukh's youngest one - AbRam is just 4. While Aryan strictly stays away from the media glare, AbRam is a favourite of the cameras and Suhana has already started making showbiz appearances. She's spotted at Diwali parties, get-togethers and earlier this year, accompanied Shah Rukh Khan to the inauguration of Arth - a restaurant designed by Gauri. Suhana also often drops by mom Gauri's interior designing boutique in Mumbai. Shah Rukh Khan, who has a reputation for being very protective of his kids, has laid down a set of rules for Suhana's probable suitors. He has revealed also that Suhana has plans of joining films but only after completing her studies.